Leicester have cut ties with another component of their Premier League title win with the sacking of manager Craig Shakespeare. The 53-year-old lasted only four months as permanent boss, following title winner Claudio Ranieri in being ruthlessly cut adrift by the club's owners. Shakespeare has paid the price for a poor start to the season but, for a club who just 17 months ago were living the dream, how has it come to this? The element of surprise that comes with a managerial sacking in the Premier League has long since been removed - even Frank de Boer's departure after only four league matches in charge of Crystal Palace carried an air of inevitability, despite many seeing it as an injustice. And while Leicester's decision to dismiss Shakespeare after eight league games of the season will raise eyebrows once more, history tells us no-one should be shocked by the latest turn of events at the King Power Stadium. If a universally popular manager and personality such as Claudio Ranieri can be sacked nine months after producing arguably the greatest story in British sporting history by guiding Leicester to the Premier League title, then all bets are off when it comes to measuring the job security of any successors. Ranieri had won only five of his first 25 league games last season, and stood just one place above the relegation zone when the end came in February for a man who had, and has, written his name in the club's - and football's - history. Shakespeare had none of that credit in the bank. 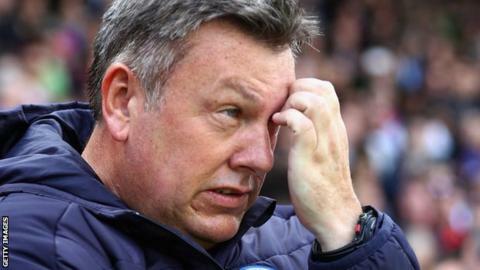 For all the claims that he was the brains behind the stunning operation that brought title glory to Leicester, he had no track record of managerial success to fall back on. Ranieri was the manager, Shakespeare merely his sidekick. Ranieri had taken Leicester to the last 16 of the Champions League, but that counted for nothing when the club's Thai owners came to the conclusion that they were facing the ignominy of following a title with relegation. They acted and were rewarded as Shakespeare, pulling together a squad many felt had stopped playing for Ranieri, took Leicester to safety. The owners demonstrated their single-minded ruthlessness, especially when the thought of Championship football strayed into their consciousness. It seems clear they feared Shakespeare may lead them into similarly dangerous territory so he has suffered the same fate as Ranieri. No shock to the system given their track record and treatment of the Italian. Shakespeare was forced to defend his players, and possibly himself, when Ranieri said: "I can't believe my players killed me. No, no, no. "Maybe it was someone behind me. I had a little problem the year before and we won the title. Maybe this year, when we lose, those people push a little more." Ranieri did not elaborate on who the figures behind him were - but Shakespeare certainly knew the price on the ticket when he was confirmed as Leicester's permanent manager in June. Because he was there in the background when it happened to the amiable Ranieri, he will have known failure, or at least the very idea of struggle, would not be tolerated. He had seen the warning signs at very close quarters. And now he has paid the same price as Ranieri. Shakespeare's sacking pushes the memory of Leicester's title triumph - and the team behind it - even further into the past. The historic campaign was held up as the perfect model of how to fashion success in the modern game in terms of management, coaching and recruitment. Ranieri, to use an old Brian Clough turn of phrase, was in the shop window but assistant managers Shakespeare and Steve Walsh, who was also head of recruitment, were regarded as the goods in the back. Shakespeare was seen as the safe hands behind Ranieri while Walsh's scouting network and eye for a deal was reflected in the arrival of Jamie Vardy from Fleetwood for £1m in May 2012, the £400,000 deal with Le Havre in 2014 for the now £50m-rated Riyad Mahrez, and the capture of N'Golo Kante from Caen for about £6m in 2015. Walsh and Shakespeare signed new deals as part of a long-term structuring in May 2016 as Leicester were touted as the example for any club outside the top six to follow. Walsh explained the approach when he told BBC Radio 5 Live: "If you just needed to get all the best players, scouting would be easy, wouldn't it? You've got to look at the players maybe through different eyes and see what they can achieve. That's the skill. "We have a DNA. For me, it's not just about their ability on the ball. It's what they're prepared to give to the team when they haven't got it." The words were plucked from Leicester's supposedly ideal world at the time - but Walsh left shortly afterwards to join Everton as director of football, and Ranieri and Shakespeare have since been sacked. Leicester's title win was always going to be a dream season - but the dream team has fallen apart quicker than anyone could possibly have predicted. A poisoned chalice and destined to fail? When Shakespeare took charge of his first game as Leicester's interim manager against Liverpool on 27 February, it was as if the clock had been turned back to the title-winning season. Those players who had done a disappearing act in the league in the final months of Ranieri's time at the club were miraculously restored as Liverpool were overrun and beaten 3-1 on a night when the King Power Stadium gave Shakespeare a warm welcome and also showed its appreciation of the sacked Ranieri. Vardy was the pacy threat of old, Mahrez the mercurial maverick, and normal solid service was restored in Leicester's defence. A Champions League win over Sevilla to reach the last eight, where Leicester were beaten by Atletico Madrid, underlined the impression that the Foxes of recent vintage had returned with their former manager's sacking. Leicester finished in a comfortable 12th position, 10 points off relegation, but Ranieri's success left Shakespeare holding a poisoned chalice. While no-one seriously expected a repeat of 2015-16, expectations were rightly raised. The top 10 was a realistic ambition, and once Leicester dropped below that line - they are 18th with a meagre six points from eight games - Shakespeare was always in trouble. Perhaps he was fighting against odds he could never overcome. Perhaps Leicester have simply reverted to what they were before that footballing freak of a season which saw a team rated 5,000-1 for the title pick up such unstoppable momentum no-one could catch them. It takes an almost impossible leap of the imagination to believe any Leicester manager will ever again achieve what Ranieri did. The bar he set for any successor will always be too high. The added problem is players such as Kante and Mahrez can achieve that again - but they will not do it at Leicester, so inevitably seek the possibilities elsewhere, another difficulty Shakespeare has had to confront. Kante did exactly that, and his move to Chelsea yielded a second title in two years. Leicester's owners may be ruthless but they are also realistic. The problem comes with having that intoxicating taste of life at the top table - while you do not expect to dine there again, it makes it even more difficult to settle for life with your nose pressed up against the window. And Shakespeare is the latest to feel that cold reality. Leicester's owners demonstrated their willingness to back Shakespeare in the transfer market when they paid £17m for Hull defender Harry Maguire, who recently made his England debut in Lithuania, and £25m for Manchester City striker Kelechi Iheanacho. It looked like a bold move to push the Foxes on from the disappointment of last season - but Leicester's, and more specifically Shakespeare's, plans were holed below the waterline by a farcical final day of the August transfer window. Danny Drinkwater, a key component of the title-winning side, was sold to Chelsea for £35m - but a replacement was already in the pipeline in the shape of Sporting Lisbon's Adrien Silva, all set to complete a £22m move. Leicester's deal-makers contrived to miss the deadline by 14 seconds, meaning the move was not finalised with Fifa, leaving Silva in limbo and Shakespeare without what he believed was a key midfield addition. An appeal fell on deaf ears and, while this may not have been decisive in shaping Shakespeare's fate, he has every right to wonder what difference the talented Portugal midfielder might have made. It was a twist of fate that was none of Shakespeare's doing - and one mitigating factor in his failure. Without Silva and, now, without the manager who attempted to sign him, Leicester find themselves in further reduced circumstances. It all seems an age since that glorious day on 7 May 2016 when Ranieri led Italian tenor Andrea Bocelli to the centre circle at the King Power Stadium and the Foxes swept away Everton with ease before receiving the Premier League trophy.